Notice – the views expressed here are mine and not those of the SFRB. Character building is a complex and time-consuming affair. You want them to be realistic, but usually they are extraordinary people caught in extraordinary circumstances. In The Wildblood series, I’ve used the relationship between two unusual people to reveal the storyline. The catch is – they are best friends, and it’s complicated. No, really it is, and there’s the fun part. The dynamics between these two reveal important subplots and hint at things that I hope keep the readers intrigued. While Wade is nearly a perfect example of an alpha male, and Shannon a head-strong alpha female, there are enough twists to make them unique. I’ve been character-building around this pair, and I’ve been world building through their interactions. Using them, I’ve expanded on family interactions, their friends and co-workers, and perhaps most importantly, the world they occupy. What makes this work for me, in this series, is that they have a unique relationship. The little quirks and details, complications that might echo similarities in Real Life. They bicker, sometimes they fight, they laugh and joke, they share their hopes and fears with each other. What are they afraid of, and what do they cherish most? In this series, the question is, what would they do to protect their home? People, even fictional ones, have their limits. The author should exploit those, and the reader should enjoy them. When I’m reading, that’s what catches me – details that I can relate to. Is this character confident and well-mannered, but afraid of large group of people? Does she dance alone when she’s happy? Does he keep a secret stash of romance novels? When all is said and done, why will I remember this character? Why would I read more, or why wouldn’t I? These are the things I consider during my many edits. Spelling, sentence structure, plot, all those things of course are important. If the story is boring or the characters don’t catch the imagination of the reader, technical stuff won’t matter. What hooks you, in that first page? I've been a lifelong Sci Fi addict, from Saturday morning monster movies, to a well-stocked public library, and being absolutely thrilled at the advent of CGI. Writing came about naturally. I love contemplating 'what if' or 'what next', and then books happen. Detailed plots, intricate relationships, surprise twists, these are a few of my favorite things. I want my readers to be entertained. Please tell us a bit about yourself: Hi, I’m Laurel Richards. I have an active imagination and knew I wanted to be a writer from an early age. I was first published by a small press in 2003 and haven’t stopped writing since, though I’ve used different pen names as I’ve evolved. My taste in genres is eclectic. 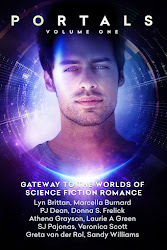 I love sci-fi romance and paranormal romance, as well as fantasies and cozy mysteries. Tell us about The Colony: The Colony is a fast-paced sci-fi romance novel about a human colony on another planet that is mysteriously wiped out in a single night. Dr. Elisa Everett is the only one left when Alexander Valerian and his security team arrive, and Alex can’t be sure if Elisa is hallucinating due to exposure to some alien element or if she really did see predators ripping the colony apart. 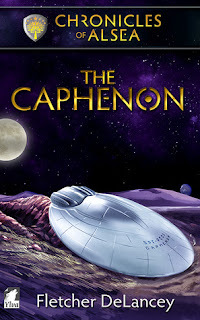 As he and Elisa search for answers, they find evidence that they might not have been the first colonists on the planet. What inspired you to write this particular story? : If we can find dinosaur bones and other incredible fossils here on Earth, imagine what we might discover on other planets. This was the idea that got me started on The Colony. The heroine is a paleontologist at a human colony on the planet of Jangala. She makes a huge discovery on this jungle planet, but soon after, the colonists suffer a terrible attack that leaves her the only survivor. Who or what really attacked them? Elisa got a firsthand look at the aftermath of what she’d witnessed onscreen: furniture upended, broken panels, and dark spatters on the walls. There was an added ingredient now, though. Here and there were dark, sticky pools of blood, standing like puddles after a hard rain. Even she could smell the brassy tang in the air. It was already beginning to sour, or maybe that was only her stomach. She didn’t have time to be sick. The sound of heavy breathing emanated from one of the side passages up ahead, followed by the deep, rhythmic thud of footsteps. Judging by the sound, it had to be a big, heavy man, or else someone who was weighed down. Elisa envisioned somebody lugging a dead body, but she couldn’t actually see anything through the gloom. More footsteps—these moving much faster—reached her ear, and she tensed when she realized they were coming directly toward her and Bria. A residential door gaped open to their right, so she and her sister jumped inside. They wound up in a woman’s bedroom. The small space was unoccupied and had clearly been ransacked. Bria grabbed the door to tug it closed, but one of the hinges was mangled. The door groaned and remained jammed open about fifteen centimeters. Elisa’s heel slid on the debris littering the floor, but she caught her balance against a metal wall unit. The racing footsteps outside came closer. Fear, combined with the scent of shattered perfume, made Elisa’s lungs burn and ache. She had a death grip on the stunner, and both she and Bria aimed for the doorway when the steps slowed. The battered man gasped and jumped back. He turned and sprinted several meters away before Bria darted into the hallway and said his name again. He stopped and finally looked at them. “Indigenous?” Elisa asked, though she knew of no such predators on Jangala. “Others?” Now Bria was the one repeating things. Elisa kept a close eye on the surrounding passageway and waited for the two officers to pull it together. She hoped they’d hurry, because she wanted to keep moving. Which comes first for you – a character's looks, personality or name? : I would have to say the personality comes to me first. The name is always last, and I often try several different character names before I finally settle on something. Any tips for aspiring authors? : Keep reading, keep writing, and remember there’s always more to learn about this craft and industry. What super-power would you choose? : It’s a tie between clairvoyance and shape-shifting. If you could have three wishes, what would they be? : Excellent health for all my friends and family, more book sales, and good fortune. Coffee, tea or wine? : Tea if I’m looking for caffeine. Wine if I’m looking to relax. What is your favourite book? (aside from one of your own! ): You’re making me choose?! I don’t have just one favorite, but I really loved Slave to Sensation by Nalini Singh. Favourite genre and why? : Sci-Fi Romance rarely disappoints me. If anything, I complain that the SFR authors make their works too short, only because I want to keep reading more. Upcoming news and plans for the future? : I have a fantasy novel, The Great Road, tentatively scheduled to come out in April 2017. 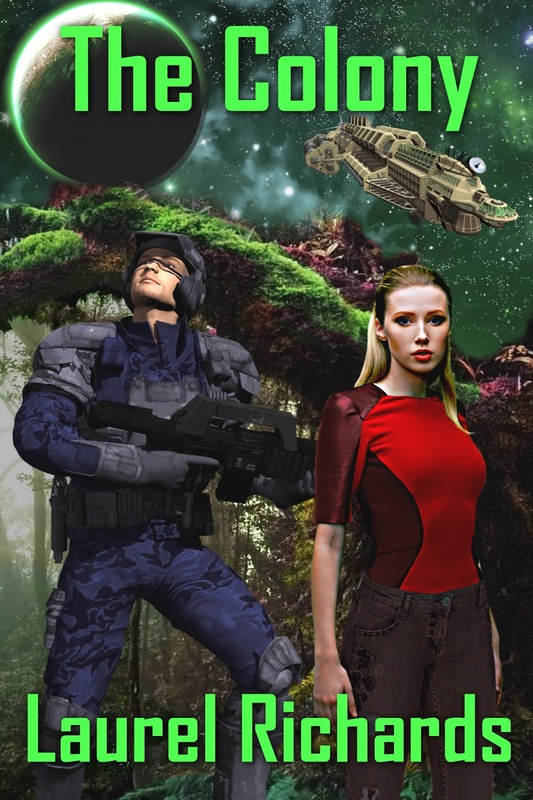 I also have another sci-fi romance, Fate’s Mission, that I hope to release later in the year. 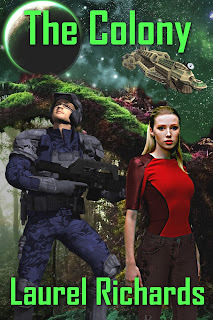 Responding to a distress call, Officer Alexander Valerian and the rest of his security team arrive at the human colony on the planet of Jangala to find blood and gore all over the walls. All the colonists are dead or missing except for Dr. Elisa Everett, a pretty paleontologist he finds injured and nearly suffocated in a ventilation shaft. Now Alex has to figure out how sixty-nine colonists were wiped out in a single night, but Elisa’s account of killer monsters just raises more questions. Has the colony really been attacked by bloodthirsty beasts, or did everyone succumb to a powerful hallucinogen that made them turn on one another? He had better find out fast, because Elisa’s life is in his hands. 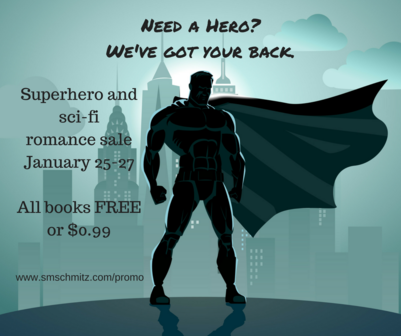 Today sees the start of a three day sale of SciFi romance titles, but the focus is on our smexy superheroes, all just waiting to come to your rescue. Click HERE to find your perfect hero at your preferred eBook retailerfor just 99 cents or free. Enjoy! On a summer night like any other, an emergency call sounds in the quarters of Andira Tal, Lancer of Alsea. The news is shocking: not only is there other intelligent life in the universe, but it’s landing on the planet right now. Tal leads the first responding team and ends up rescuing aliens who have a frightening story to tell. 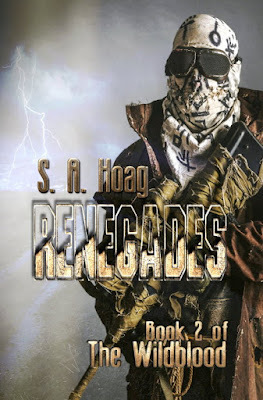 They protected Alsea from a terrible fate—but the reprieve is only temporary. Captain Ekayta Serrado of the Fleet ship Caphenon serves the Protectorate, a confederation of worlds with a common political philosophy. She has just sacrificed her ship to save Alsea, yet political maneuvering may mean she did it all for nothing. I enjoyed the way first contact worked in this book-- I got introduced to a full and vivid society through the eyes of the ship’s crew. I also liked the how the story addresses some larger questions of what to do what desperate tactics people must sometimes employ in a war and the toll it takes on them. The romance plot in this story (f/f, fade-to-black heat level) is atypical in that it showcases a couple who’ve already gotten together, though only recently. Their new relationship is tested by a worthy rival and the circumstances that force some decisions that hurt them. I really believed that by the end the two of them could weather anything together.